Visit SmileBox online at Smilebox.com which is a photo service that lets you quickly turn life’s moments into digital creations to share with others or save for yourself. At SmileBox you can choose from hundreds of designs including scrapbooks, slideshows and greeting cards, then drop in your photos and videos and add your own music and text. 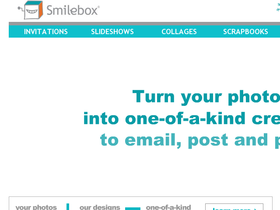 Once you've finished your Smilebox creation, you can email it, post it to Facebook or MySpace, blog it, or print it. Save money on your creations with SmileBox discounts, SmileBox coupons, SmileBox promotions and SmileBox savings found here on 58Coupons.com. When you sign up for an annual membership to club smilebox for just $39.99, you can save 40% off the monthly price. Act now and you can create and share free e-cards in just minutes with SmileBox.com. With SmileBox.com you can create free scrapbooks and photo albums online and share them with your friends. Subscribe to Smilebox.com for as low as $5.99 per month. Now you can go green with digital party invitations from SmileBox.com. Click link to start. If you're sick of the ads, buy a premium design and you'll have an ad-free design from SmileBox.com.